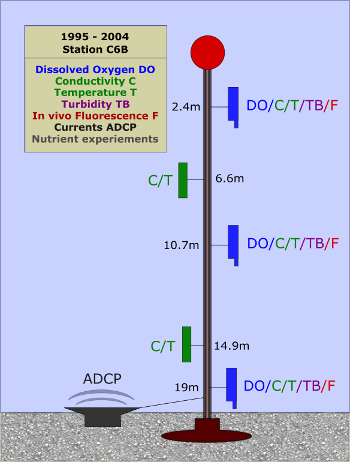 Near-surface and near-bottom current meters and a near-bottom oxygen meter have been deployed at a single location in 20-m water depth since 1989 (C6A or C6B). 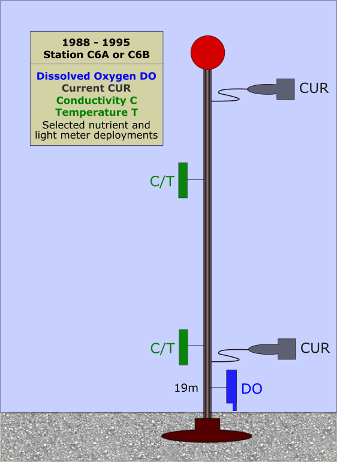 Instrumentation was expanded in 1995 to include near-surface and mid-water oxygen meters, additional conductivity/temperature sensors in the vertical water column, and shorter deployments of nutrient and light meters. These instruments are designed to collect continuous time-series data at a particular depth. Parameters measured by our instruments include dissolved oxygen, conductivity, temperature, currents, nutrients, and turbidity. LUMCON scuba divers maintain these instruments. C6 Station:C6 A and B are mounted on a single oil platform. In 2004 the oxygen sensors, nutrient meters and light meters previously deployed at stations C6A and C6B were combined with the meteorological and physical data captured by the LSU WAVCIS system, with real-time transmission of data (C6C, CSI-6 of WAVCIS). This expansion resulted in a coordinated interdisciplinary study of the physical and biological dynamics underlying the formation, maintenance and duration of hypoxia under the expanded acronym of WAVCIS/BIO2.